Hi. Today is my birthday. I am 30. My goal this year is to start making things with my hands again and writing about it all. So here we are. I haven’t written in 3 years. Most of that time was not very kind to me, mainly for health reasons. But the last year has been amazing. So I’m kicking off my 30th birthday by reflecting on my top 10 favorite things that happened from my 29th year (in chronological order). It was a big year — I could write a standalone post about each of these things — so grab a cup of tea and let’s catch up. After 2 years of thinking about it, saving, and searching — we are homeowners. As someone who grew up dirt poor, this is definitely something I didn’t know I could accomplish. Every morning I lie in bed and watch our room grow brighter, look out over our backyard, and reflect on how thankful I am to have a blossoming homestead. 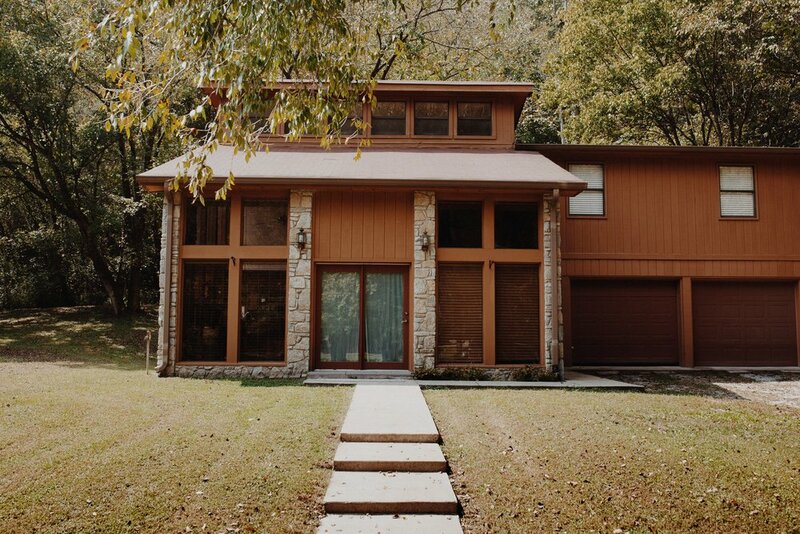 We have an endless list of projects queued up to make our house feel like a home and reflect who we are, and after an incredibly intense couple of years, I’m excited to spend time getting settled in. This was a good year professionally. I received my company’s Above and Beyonce award, I was promoted to team lead, I hired two incredible people, and now I manage a growing team focused on content. For the first time since I left the baking/candy industry, I feel like I have a career and not a job. It’s honestly a really nice feeling. 3. 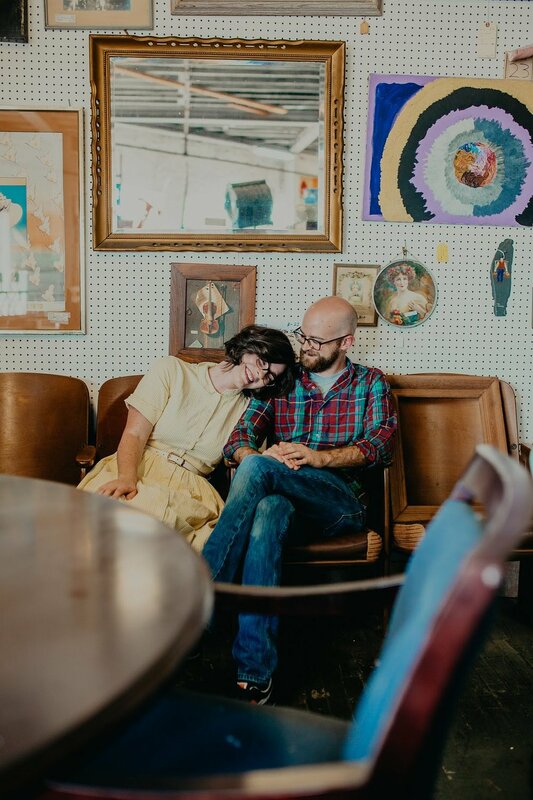 We took engagement photos! I’ve never really understood engagement photos. But then we started wedding planning and quickly discovered multiple things we wanted to use professional, current photos for. Also, a couple’s or engagement session is the perfect opportunity to work with your photographer before the wedding. And who are we kidding, I’ll take any excuse to have my photo taken by Ryan Green! 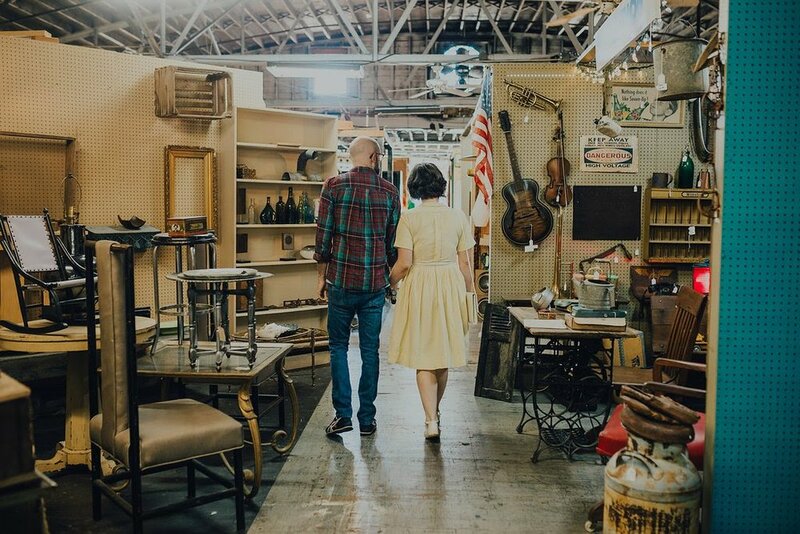 For this shoot, we did what we do best: Headed to our favorite antique shops, aka: our natural habitat. 4. We watched the total solar eclipse on a boat! We took the day off, headed to the lake, and watched the eclipse from the water. 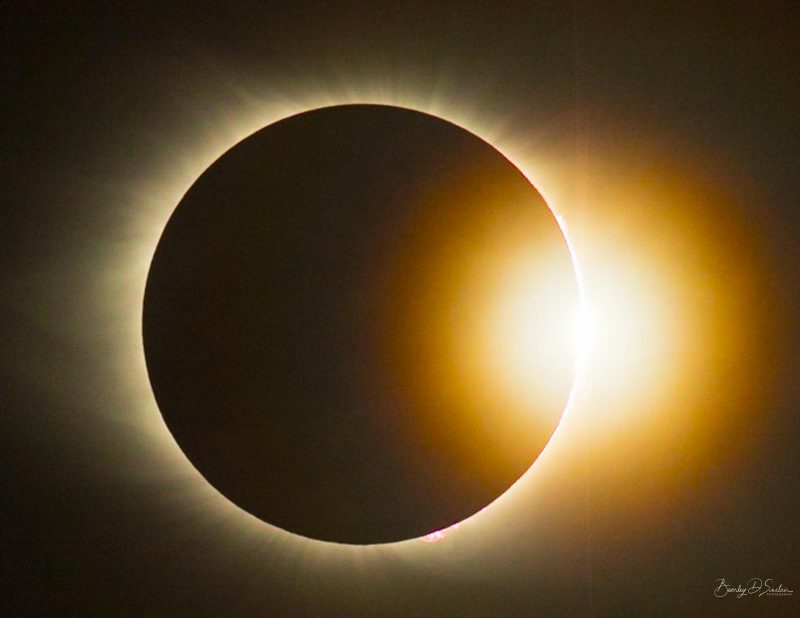 The path of totality touched 14 states, and the rest of the U.S. had a partial eclipse. Seeing this with my closest friends was a magical, humbling experience. I’m so excited to keep spending lifetimes with Nick. He makes me a better person, believes in all my wild ideas, and trusts me to help make our life’s dreams come true. I’m thankful everyday that I found my person. Ryan Green captured the day flawlessly. 6. 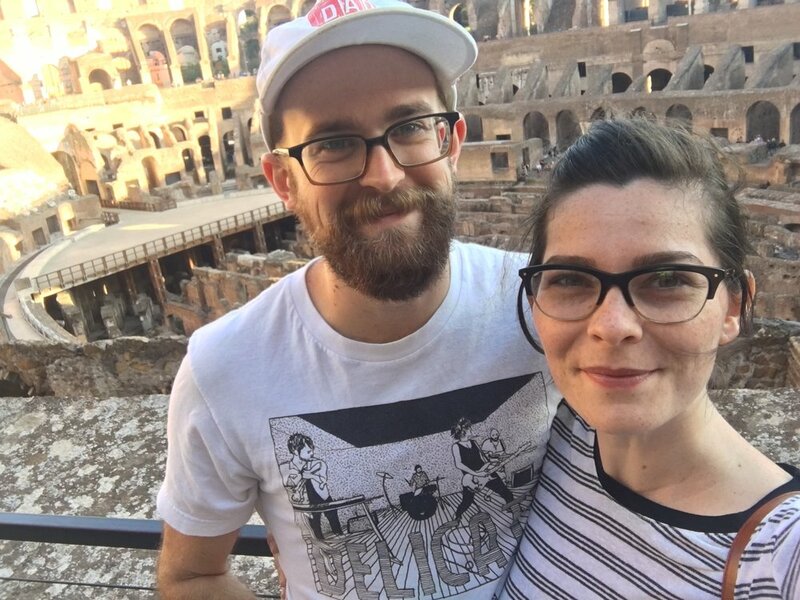 We honeymooned in Italy! We took our first international trip. We flew into Rome and city hopped to Florence, Cinque Terre, and Milan. It was breathtaking, stressful, and delicious. The language barrier was challenging at times and we didn’t spend nearly enough time in each city. But we had glorious views, prosecco almost daily, and took a pizza and gelato making class! I would go back in a heartbeat, we made some of my favorite memories on that trip. 7. We added a puppy to our family! I’ll save the full story for another post. 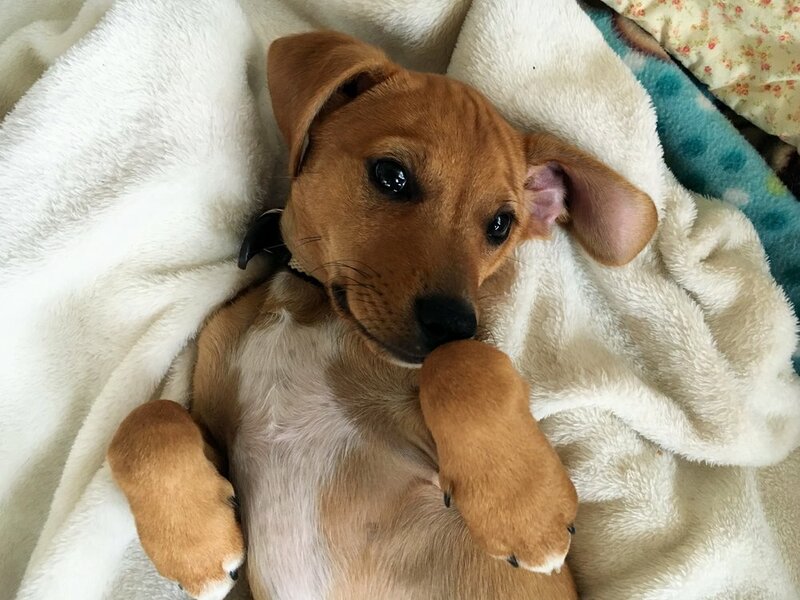 All you need to know right now is that we have little hound mix named Pickle. He’s cute, he’s energetic, and I am completely obsessed with him. He’s taught me so much patience and grace these last few months. And no, Olive the cat is not his friend (YET — but we are determined to change that). 8. We had our first Christmas tree adventure! We chopped it down ourselves! 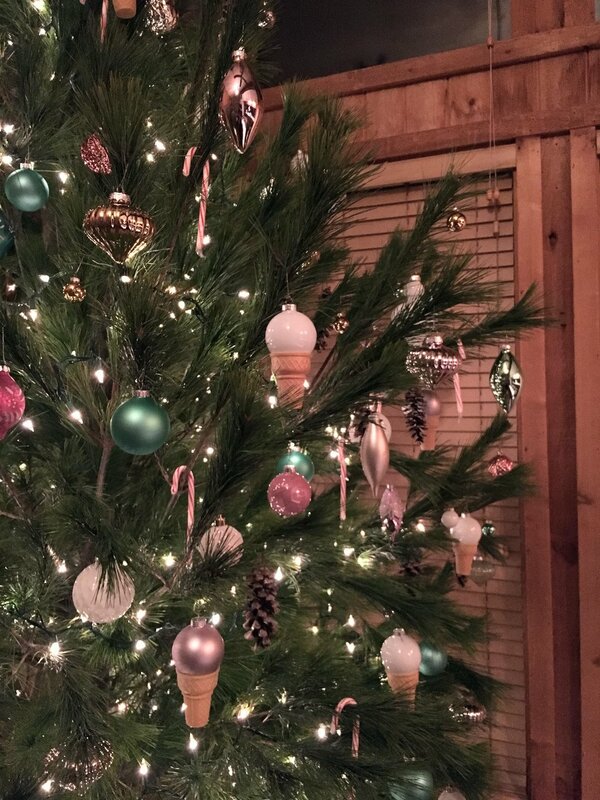 We made ice cream cone ornaments! It was all very magical and sticky and festive. In all our time together, this is the first year we’ve put up a tree. 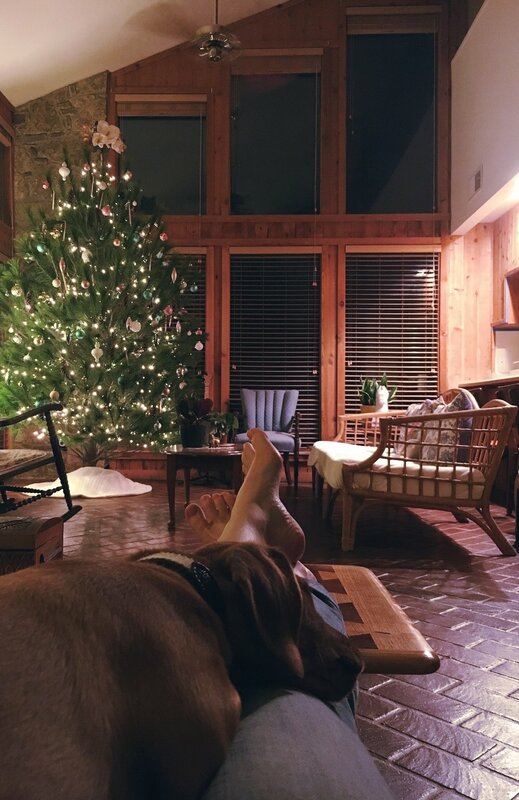 Maybe it was the house, or the wedding, but for some reason, it felt right for this to be the year we got a tree. I can’t wait to get an even taller one next Christmas! 9. I lost 30 pounds! This is something I am really proud of. Most of my weight loss was intentional (simple portion control and healthier meals) . . . but some of it can be attributed to wedding stress. Oops. I’m just happy that I feel great. Now, if I could just replace my entire wardrobe with clothes that actually fit so I can look great, that’d be nice. 10. I stopped being in chronic pain! It’s hard for me to cover this without writing a novel (which is exactly why I plan on writing a personal zine about it!). Basically, my jaw joint was misaligned and ruined my body and life for a long time. After a lot of searching, I found a knowledgeable doctor. I’ve been in treatment for 16 months and have about a year left until it’s complete, though I am feeling much better. I have a jaw joint disorder. For almost 2 years, I had daily headaches and weekly migraines, along with one or more of the following: jaw pain, jaw popping/cracking, jaw locking closed (two times, each for ~4 months back to back, so I was essentially locked closed for 8 months), neck/shoulder/back pain, ringing in ears, ear pain, nausea, difficulty swallowing/feeling of a foreign object in throat, numbness in fingers/hands, referred (phantom) toothaches, eye pain, light sensitivity, difficulty sleeping, fatigue/exhaustion, memory loss, short term memory impairment, difficulty concentrating, and brain fog. Honestly, just typing that list puts a frog in my throat and tears in my eyes. It literally hurt me to be alive. I had to quit doing a lot of things I love, including hobbies and even just being a good friend. I was in so much pain, that eventually I had to give myself permission to hibernate from the world and focus on survival, even if that meant not making books or doing creative things. When I finally started feeling better, I didn’t pressure myself about anything. I just did whatever I wanted, took life slow, and ended up having one of the best years of my life. None of the above would be possible if I didn’t find a doctor that helped me feel better. I can’t wait to see what my 30th year brings! I know it won’t be a checklist of life milestones — and I am more than okay with that. I just want to make things with my hands, keep training Pickle, settle in to our house, and be a better friend and all around person. I’ve felt really pressured in the past to only write about my art in order to grow my business, but from now on, I’m just gonna write about whatever I want and hope for the best. That seems to be what makes me happiest. And if I’ve learned anything in the last year, it’s to do more of what makes you happy. Photos: #1-5 by Ryan Green of 30MilesWest, unless otherwise noted. All others by me or Nick. When I was ten years old, I wrote, illustrated, and created my very first handmade book. In celebration of my birthday today, I thought it would be fun to share that book with you! Henry Graham Greene once wrote, "There is always one moment in childhood when the door opens and lets the future in." During middle school, I was an avid reader and writer. In high school, I filled composition notebooks with angsty stanzas and by senior year had joined the literary magazine staff. Going into college, I became the poetry editor of the campus creative arts publication, and my final thesis project was a series of five small handbound books containing my original poetry. Almost one year ago, I opened by own bookbindery and these days, I'm currently working with a few writers to turn their own poetry collections into chapbooks. Though I was born a skeptic, even I can't deny that things always have a way of coming back full circle. The following poems and illustrations are both hilarious and nostalgic to me. I vividly remember drawing the picture below, but I don't really recall any of the writing. I believe we would learn about a type of poem, and then the assignment was to write one. Looking back now, I have a sneaking suspicion that we were also learning about adjectives. Either that, or I simply enjoyed colorful language. I believe my elementary school was "The Mighty Oaks" or something, hence the stamp below and the foil embossed label above. Maybe we were learning about the full publishing process? I can't be sure. But I do distinctly remember sitting next to the teacher, gazing out the classroom window, and happily gluing stacks of books together— transfixed by that magic moment when several pieces come together to form a whole. Sometimes things aren't as different as we like to think they are. I'm still transfixed by those moments. Whether it's stitching a book together, watching live music, baking a cake from scratch, or realizing random bits of your past have aligned to let to the future in, those are the powerful moments I'm celebrating today. Charming, no? Happy birthday to the adorable tiny skeptic who hates men telling her to smile. Thanks for reading my story— cheers to many more years of writing, learning, and making books! On My Desk: The Making of "Life and Literature"
Life and Literature is possibly one of my favorite book arts projects to date. I'm even more excited to share it with you because I remembered to actively document the entire process, so I have tons of progress shots to share with you! Now this definitely isn't a full tutorial, but I thought it would be fun if you could have a peek at what it's like to make one of my books. This book was made as a surprise birthday gift for one of my close friends, Sasha. Her mother secretly contacted me and requested an art piece for Sasha, who loves literature. Life and Literature is the gift we came up with. It's a series of miniature hand embroidered books collected inside a tattered and discarded copy of an actual book titled "Life and Literature." The original book has been carved out to include 12 niches— one for each miniature handmade book. Every tiny book contains hand watercolored pages, vintage dictionary papers, and an inspirational quote written with a vintage Smith-Corona typewriter. All these pages are sewn together and an embroidered portrait of the author of each quote decorates the covers. But enough of the finished book— let's look at how it came to be. Step 1: Create the accordion book structure. I decided to use a simple accordion style binding for the miniature books— with signatures sewn in for extra fun. I knew the finished size needed to be about 2.75 x 2.25 inches in order to fit all 12 books inside the larger book. I worked backwards from that measurement to figure out what size to make my accordion structure and inner pages for the quotes. But don't worry, I won't bore you with the math. However, I will bore you with bookmaking terminology! In this example, the watercolor background below is the "accordion' part; the pages that are folded and sewn in later (pictured in step 2) are the "signature" part. To make the accordion structure, I watercolored sheets of paper in colors that coordinate with the larger book. Then I cut, scored, and folded the larger sheets of paper into 12 small accordions. Watercolor strips cut down to size. Papers scored and ready for folding. The folding direction is alternated to create a paper structure resembling an accordion. Step 2: Select and sew in vintage dictionary pages and hand-typed quotes. Next, I typed out each of the 12 quotes I selected on a pretty cream paper with subtle sparkly accents. I also cut down vintage dictionary pages to include in each book because they are beautiful and they fit with the literature theme. Now normally you would create a template and punch holes for sewing and make sure everything is very particular. But I didn't do this. Since all of my quotes were different and I didn't want the stitching to cover any of the words, I just eyeballed all the sewing and poked holes with my needle as I went along. Step 3: Marvel at the little army you've created and take way too many pictures. Okay, so I know this post is photo heavy. But I wanted to include enough pictures so you can see the different angles and how this type of binding works. I think the photos from above really help show how the pages are sewn in. Step 4: Create and attach the covers. For the covers, I decided to go with classic author portraits. But of course I couldn't leave it that simple— I had to embroider them to add a little whimsy to the seriousness of the black and white portraits. I cut, scored, and folded 12 green covers that wrap around to fit each accordion. Then I added an author's portrait to each cover and embroidered it. Lastly, I attached each accordion to its cover by gluing the first and last accordion fold to the cover. Step 5: Create the hollowed out book structure. The final step was to hollow out 12 niches in the main book and check that each mini book fits inside the corresponding spot. Then I glued along the edges of the book so it became a solid piece with no individual pages. Life and Literature: a book filled with inspirational quotes from a dozen different (mostly) classic authors. Whew. What an absolute joy this project was! I generally like to reflect on my artwork and think about what I would do differently if I remade a piece, but I am really pleased with how this turned out. However, since I'm all about pushing myself for growth and learning, if I had to change one thing, I suppose it would be the button and string that holds this book closed. Overall, I don't hate it and I think it works just fine here. But in a broader sense, I can see that's an area I don't know much about and I can probably improve. So I think I'll try to explore different ways to fasten books and learn more about closures in the future! If you'd like to see additional finished photos of Life and Literature or learn more about the backstory, just visit the portfolio page for this handmade artist's book. You'll even find a slideshow at the bottom so you can read each author's quote and see interior details of each book. Would you be interested in making or owning a book like this? What inspiring quotes would you choose to feature? Let me know your thoughts in the comments!